The relatively fragile structure of biomolecules makes them difficult to purify. In general, small molecules are purified through high-performance liquid chromatography (HPLC) at elevated temperatures, high pressure, and by using inorganic solvent mixtures. However, in the case of proteins, it is not possible to apply these conditions since they consist of amino acids linked up as a chain, where the chain is folded into a three-dimensional structure that should be preserved during the separation process. In order to satisfy these criteria, fast protein liquid chromatography (FPLC) has been developed, which involves performing purification at low pressure, in salt buffers that simulate the natural water-based environment of the proteins, in general at 4 °C or at room temperature. Moreover, in order to prevent corrosion through the saline buffers needed for this method, metal parts have been replaced by bioinert materials like PEEK. Biomolecules are typically purified from eukaryotic or bacterial cells, which are full of RNA, DNA, other proteins, and cellular membranes. Therefore, it may be difficult to purify the antibody or protein of interest from a cell extract. Biochemists developed various techniques for such purification. For instance, they made the proteins to be overexpressed in cells, which would result in a huge proportion of protein in the cell being the protein of interest. Moreover, it is feasible to express the protein of interest that has a unique purification tag, which can be identified by the FPLC column media. It is also feasible to exploit the intrinsic properties, such as isoelectric point and hydrophobicity, of the biomolecule for purification purposes. Affinity chromatography (AC) is a technique in which a specific affinity of the protein toward the media is exploited for purification purposes. In this case, a tag can be used at the beginning or the end of the protein. A tag that is more often used is the so-called His-tag, a multiple-histidine residue that gets attached to Ni ions, which can in turn be immobilized on the column media. Another example for AC is exploiting the natural affinity of antibodies to a protein A, which also can be immobilized on the column media. This particular binding facilitates a purification protocol that comprises of three phases — loading, washing, and elution. When the sample is loaded on the column, the specific interaction leads only the target protein to be enriched on the column while all other molecules are directly eluted without interaction. Once the loading is finished, it is possible to perform a washing step in which all superficially interacting side products are eliminated. The biomolecule of interest can be released from the column and gained at best in higher quantities as well as with pure quality by selecting a competing ligand to this interaction during the elution phase of the purification process. Size exclusion chromatography (SEC) is another technique used for FPLC. SEC involves separating the biomolecules based on their size. The SEC column media is made of porous beads into which smaller molecules can diffuse and are retained by the media for a longer time, while larger biomolecules virtually do not interact and therefore elute first. Ion exchange chromatography (IEX) is an approach in which the intrinsic properties of proteins are exploited. In this method, proteins are separated based on their charge, which in turn depends on their pH and their isoelectric point. If the charge of the protein is more at the given pH of the purification media, it binds well to an oppositely charged resin. When the elution buffer’s ionic strength is increased, the less charged proteins tend to elute from the column first, followed by proteins of higher charge. Hydrophobic interaction chromatography (HIC) is another method in which the intrinsic properties of a protein are exploited for purification. In this case, a protein’s hydrophobicity is used for separation. Figure 1. Different FPLC methods at one glance. Since biomolecules are a highly diverse category of molecules, purification most often involves a blend of these techniques, leading to longer purification times and a number of manual steps in between these techniques. 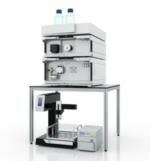 Automated two-step purifications can be carried out to minimize manual interaction and reduce the time and labor spent between individual purification steps. In this case, two columns, used for different purification techniques, are directly used one after the other only separated by valves and a storage loop. Thus, it is possible to combine affinity chromatography with size exclusion chromatography, thereby enhancing the purification speed and product quality. Rapid changing of sample buffer is highly significant specifically in antibody purification. The low pH conditions that prevail during the elution from the affinity column make the proteins lose their structural integrity and thus function. The denaturing of the target proteins can be avoided through automation and thus sequential purification and desalting. KNAUER is an owner-managed middle-sized company with more than 120 employees situated in Berlin, Germany. Since 1962, KNAUER has been producing and developing high performance liquid chromatography (HPLC) systems. The HPLC technique is used to separate, identify and quantify substances in a mixture. It can be used for many applications, including the analysis of toxics in drinking water, the detection of drugs in blood as well as for the purification or quality inspection of pharmaceutical and chemical products.